^ Kennedy, Betty Raab. 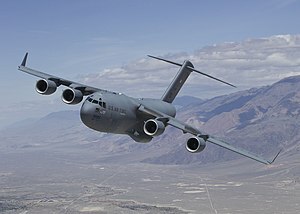 "Historical Realities of C-17 Program Pose Challenge for Future Acquisitions." Archived 29 December 2006 at the Wayback Machine Institute for Defense Analyses, December 1999. ^ "Technical Assessment Report; C-17 Wing Structural Integrity." Archived 28 March 2012 at the Wayback Machine Department of Defense, 24 August 1993. Retrieved: 23 August 2011. 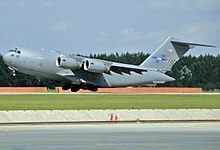 ^ "Air Force Secretary Says Modernization, C-17 on Track." Archived 14 September 2007 at the Wayback Machine Air Force magazine, 19 September 1995. ^ Sanchez, Senior Airman Stacy. "Edwards T-1 reaches 1,000 flight milestone." Archived 17 March 2012 at the Wayback Machine 95th Air Base Wing Public Affairs, 20 March 2008. ^ "BDS Major Deliveries (current year)." Archived 11 March 2010 at the Wayback Machine Boeing, March 2014. Retrieved: 5 April 2014. ^ a b "C-17/C-17 ER Flammable Material Locations." Archived 25 October 2007 at the Wayback Machine Boeing, 1 May 2005. ^ "Boeing C-17 Globemaster III Claims 13 World Records." Archived 15 April 2012 at the Wayback Machine Boeing, 28 November 2001. ^ "Collier Trophy, 1990–1999 winners." Archived 28 May 2008 at the Wayback Machine National Aeronautic Association. Retrieved: 1 April 2010. ^ "105th Airlift Wing, New York Air National Guard – History" Archived 14 February 2013 at the Wayback Machine . Retrieved 3 March 2014. 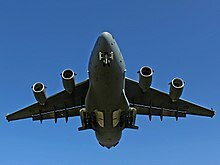 ^ "Boeing delivers 6th C-17 to Royal Air Force." Archived 17 June 2008 at the Wayback Machine Boeing, 11 June 2008. ^ "RAF to get 7th C-17." Archived 7 July 2011 at the Wayback Machine AirForces Monthly, 18 December 2009. 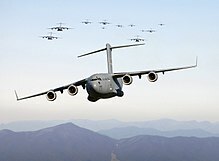 ^ "Air Force's C-17 fleet delivered on time, on budget." Archived 29 September 2011 at the Wayback Machine The Hon. Greg Combet MP, Parliamentary Secretary for Defence Procurement, 18 January 2008. Retrieved: 1 July 2011. ^ Clare, Jason. "Sixth C-17A Globemaster III – Letter of Request." Archived 9 June 2016 at the Wayback Machine Department of Defence. Retrieved: 23 September 2011. 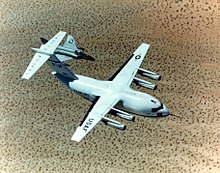 ^ "Purchase of additional C17." Archived 21 March 2012 at the Wayback Machine Minister for Defence and Minister for Defence Materiel – joint media release, 20 March 2012. ^ "The Standard For Strategic Airlift". Retrieved 11 October 2018. ^ "First CC-177 Globemaster III Receives Patriotic and Enthusiastic Welcome." Archived 25 November 2007 at the Canadian Government Web Archive Department of National Defence. Retrieved: 2 August 2012. ^ "Canada takes delivery of final CC-177." Archived 10 July 2007 at the Wayback Machine Canadian Forces, 3 April 2008. ^ "Aircraft – CC-177 Globemaster III. "Archived 27 December 2012 at the Wayback Machine Royal Canadian Air Force, 15 January 2010. ^ "Top of the world welcomes CC-177 Globemaster III." Archived 11 June 2011 at the Wayback Machine airforce.forces.gc.ca. Retrieved: 18 August 2011. ^ CTVNews.ca Staff (19 December 2014). 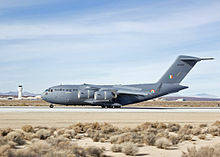 "Ottawa to buy 5th C-17 aircraft". Bell Media. CTV News. Retrieved 21 November 2017. ^ "Background." Archived 11 November 2011 at the Wayback Machine Heavy Airlift Wing. Retrieved: 2 August 2012. ^ Petersen, Melody. "Boeing auctioning equipment as it closes C-17 plant in Long Beach". latimes.com. Retrieved 16 April 2017. ^ Knowles, Victoria. "C-17 Globemaster for Indian Air Force." Archived 3 August 2012 at the Wayback Machine Armed Forces International, 1 August 2012. ^ Sillia, George. "MD-17 Receives FAA Certification." Archived 9 June 2007 at the Wayback Machine Boeing, 28 August 1997. ^ Saling, Bob. "Boeing Is Undisputed Leader In Providing Air Cargo Capacity (Boeing proposes BC-17X)." Archived 14 January 2011 at the Wayback Machine Boeing 28 September 2000. ^ "Canada's New Government Re-Establishes Squadron to Support C-17 Aircraft." Archived 28 May 2008 at the Wayback Machine Canadian Department of National Defence, 18 July 2007. ^ "Home of the 145th Airlift Wing". www.145aw.ang.af.mil. Retrieved 22 April 2019. ^ "Bagram Runway Reopens After C-17 Incident." Archived 18 February 2008 at the Wayback Machine DefendAmerica News Article. Retrieved: 2 August 2012. ^ "Bagram C-17 Accident Investigation Board complete". Air Mobility Command. 7 May 2009. Retrieved 8 July 2017. ^ worldmediacollective (9 September 2013). "Alaska C-17 Airshow Rehearsal Tragedy 2010". YouTube. Retrieved 8 July 2017. ^ USAF Aircraft Accident Investigation Board Report for Incident of 28 July 2010 Archived 4 March 2013 at the Wayback Machine , retrieved 8 July 2017. ^ a b "Arctic Thunder to continue after 4 died." Archived 2 August 2010 at the Wayback Machine adn.com, 30 July 2010. ^ Ryan, Patty (20 July 2012). "Air Force C-17 Globemaster III makes surprise landing at Peter O. Knight Airport on Davis Islands". Tampa Bay Times. Tampa Bay. Retrieved 22 April 2019 – via www.tampabay.com.